"'Whatever has happened to this -- someday someone will die -- and wall or not -- the public will not understand why we were not more effective..."
There are some who say that the left honors and embraces failure, that the bigger failure you've been the more likely you are to see promotion and power in the Democratic Party. I don't know how true that is, but people who have been colossal failures do get high profiles in the party: Jimmy Carter, for instance. Perhaps the greatest example is Jamie Gorelick. 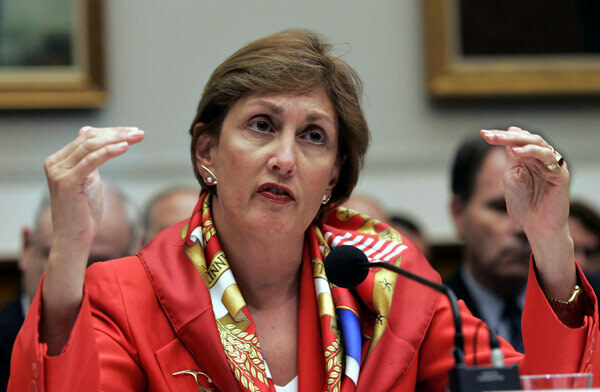 Earlier this year there were rumors that Ms Gorelick was going to be Obama's new head of the FBI. Gorelick is going to be on the Defense Policy Board along with some other folks, and for the life of me I cannot comprehend why. This woman has had her hand in some of the most catastrophic and horrific failures of policy in the last twenty years. Not just bad ideas, but bad ideas she directly contributed to and formed that had ghastly consequences. Doug Ross calls her the "Mistress of Disaster" a sort of Typhoid Mary who trails death and misery in her wake but appears unaffected. The first I heard of this woman was when she somehow made it on to the 9/11 Commission and we found out that her policy and ideas were directly responsible for the lack of intelligence which led to the event. She was on the wrong side of the table during that entire episode. She was the one who had pioneered the "wall" that forced different intelligence agencies and law enforcement bodies to separate data and not communicate easily. Jamie Gorelick. Thousands died as a result of this brilliant policy of preventing communication that arose during the Clinton administration (which makes me wonder what genius policies are being established under President Obama, policies we'll only hear about after they cause some disaster). The two biggest disasters of the last 30 years, if not longer: Gorelick was a the heart of both. Oh, by all means, lets give her more responsibility. Clearly she's demonstrated a track record of beneficial public service and quality work. According to Democrats, at least.